“Control & release” is a cooperative technique used by savvy cyclists to discourage unwise/unsafe passing. Generally, the rules about overtaking and passing apply to operators of all vehicles. Passing must be accomplished safely and without interfering with the vehicle being passed. Overtaking drivers must change lanes to pass another vehicle unless the lane is wide enough (14-16 feet, depending on vehicle size) to pass a bicycle safely, allowing a minimum of 3 feet of clearance, while remaining within the lane. If on-coming traffic, a blind curve or other hazard exists, the overtaking driver must wait until the hazard is no longer present. Bicyclists in narrow lanes are not required to keep right or ride single file, regardless of the presence of drivers desiring to go faster. Bicyclist must only move right and ride single file if the lane is wide enough to share. 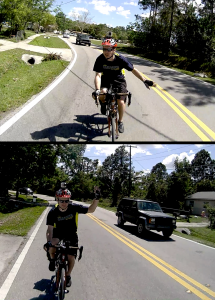 A bicyclist remaining far to the right in a narrow lane is at risk of unwittingly encouraging drivers to attempt to unlawfully and unsafely pass within the lane. Moving to the center of the lane communicates to the overtaking driver that there is not room to safely pass within the lane. Bicyclists may even move to the left side of the lane to discourage a pass where there is oncoming traffic, limited visibility to the oncoming lane or a stop sign, stop light or queued traffic ahead. Motorists often try to pass without taking such things into account, smart and assertive bicyclists will attempt to stop an unwise pass. Question Nathan asked: If two cyclists are on the shoulder, one with (motorized) traffic and the other against traffic, who has right of way?